Aerosmith has canceled the remainder of its summer tour. The band's publicist, MSO, issued a statement late last night saying "it is with great regret" that the band is canceling the rest of its tour. Singer Steven Tyler broke his left shoulder and needed 20 stitches in his head when he fell off the stage during an Aug. 5 performance in South Dakota. Doctors have advised Steven to take the time to properly recuperate from his injuries. "Words can't express the sadness I feel for having to cancel this tour," guitarist Joe Perry said in the statement. 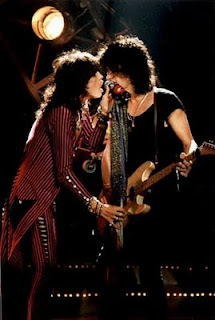 He also said they'll "get the Aerosmith machine up and running again as soon as possible." "I just want to say that I'm plain grateful that I didn't break my neck," Steven said in a statement earlier yesterday. "In truth, after thousands of live shows, falling off the edge four times ain't too bad." Ticket refunds for the remaining tour dates will be available at the place of purchase.